The segment of the satellite industry garnering a great deal of attention is that of the small satellite. From previously taking the role of an engineering tool for higher education, the small satellite is becoming noted for its attractive cost factors, ability to launch within a shorter time frame, and on-orbit effectiveness. No longer are small satellites simply the bailiwick of universities  commercial and military projects are springing up around the globe to test the effectiveness of these smaller spacecraft to determine their viability for a variety of crucial projects. The European Space Agency will present the Second European CubeSat Workshop, to be held at ESA/ESTEC in January of 2009. We availed ourselves of the opportunity to chat with some leaders involved in the small satellite industry. One such individual is the Executive Vice President and General Manager, Space, for Comtech AeroAstro, Patricia A. Remias. Dr. Steve Mackin pioneered a new approach for deriving quality control indicators from Disaster Monitoring Constellation data. The new framework, which is being implemented by DMCii, holds great potential for quality control and consistency in multi-source imaging projects, such as the European Global Monitoring for Environment and Security (GMES), now known as Kopernikus. The European Space Agency (ESA) has expressed interest in the techniques that Dr. Mackin presented in his role as one of the U.K.s representatives in the Working Group for Constellation Calibration on the Committee on Earth Observation Satellites (CEOS). The first dedicated GMES satellites, Sentinel-2 and Sentinel-3, will demonstrate (at least in part) the new framework as a quality control measure for GMES. Youve definitely heard of the, those small, 1 kg satellites called Cubesats, so named due to their physical dimensions being that of a 10 cm cube. They are extremely popular as an educational tool at universities, but is it truly feasible to create a functioning satellite within so small a package? Additionally, do Cubesats have any practical use, or are they merely just a toy? In the 1990s, the space community witnessed the revolution that is now the Small Satellite market. Small satellites were initially written off as not being large enough to have any real practical function; however, since the early 2000s, space companies large and small have been falling over themselves to get involved in Small Satellites. This class of spacecraft has proven to be much more useful than the skeptics proffered. With the Small Satellite market experiencing brisk business, many of us within the Small Satellite community are now wondering where the next revolution will come from. Inmarsat, traditionally the dominant player in shipboard communications, is rapidly loosing ground to VSAT alternatives as the demand for fixed-price broadband goes to sea. The rapidly evolving desire for high transmission rates at 512 Kbps and above in the large merchant shipping fleets, along with requirements for gigabytes of data transmission per/month, means Inmarsats data hungry, high-end users will move to take advantage of soon to be complete Global Ku-band coverage. A solar sail is a spacecraft without a rocket engine that is pushed directly by light particles from the Sun, with the sunlight reflecting off its giant sails. Composed of a gossamer material, when unfurled in the vacuum of space, the sail feels the pressure of sunlight and is propelled by that pressure to carry spacecraft among the stars. Satellites are achieving unparalleled efficiency with a new protocol, DVB-S2. The performance of DVB-S2 satellite systems is very close to the theoretical maximum, defined by the Shannon Limit. That efficiency could be pushed even further by network optimization tools and equipment recently developed by European researchers. Very Small Aperture Terminal (VSAT) is overwhelmingly the most prevalent mechanism for satellite communications. While most elements of this document cover all forms of satellite communications, for convenience, the term VSAT will be used throughout. Go big or go small? Rarely have we had such an opportunity to witness the contrast in evolution of the size and scale of satellite systems in such a short time span. Nearly three months ago, and, coincidentally, merely a week apart from each other, we witnessed the launch of two new ways to observe the world and, indeed, two ways to see the future of satellites. Citing difficult market conditions and slow adoption of IPTV by small U.S. telcos, SES Americom announced it will cease IP-Prime operations by July 31, 2009. While SES has made progress in the number of telcos using the service (37), the number of end subscribers totals 10,000, implying (on average) single-digit TV service penetration in the telco markets. Participants at the CANEUS 2004 and 2006 Conferences, held in Monterey, California and Toulouse, France, agreed that in order to open up the market for small satellites and facilitate dialogue between the many stakeholders in the industry, it was necessary to create an international consortium to coordinate, standardize, and offer launch opportunities for the small satellite industry. Over the last few years, driven by the cubesat idea, the industry has seen increasing global interest in pico- and nano-satellite research at universities. So far, the motivation for these activities has been mainly educational and often an exemplar of the me too attitude where the university initiates a project due to the interest from students  and lets not forget the media attention such projects can attract! Small satellites (TacSats, microsatellites, nano-satellites, pico-satellites  whatever the nomenclature) potentially offer many positive benefits when compared to traditional satellite programs. Lower costs, shorter development and acquisition timelines, increased operational responsiveness, and an ability to augment on-orbit capabilities highlight a few examples of positive benefits. To fully realize their potential, these assets will require responsive ground systems that are flexible, expandable, capable of supporting multiple platforms, and responsive to technological advances. 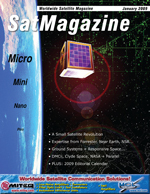 SatMagazine + MilsatMagazine are offered as online viewable magazines and also as downloadable .pdf versions  there is no charge for access. Some issues are also printed for distribution at various conferences, exhibitions, and trade shows, and they are so indicated in the list below. SatNews is our daily satcom, milsatcom, and ancillary businesses daily/weekly news site.